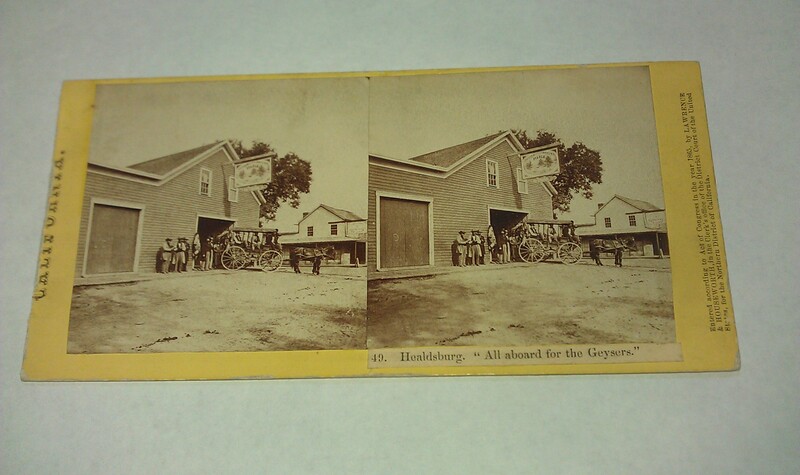 1866 Healdsburg Main St Geyser Livery Feed Stable Stagecoach Lawrence Houseworth Stereoview #49 Titled Healdsburg, All aboard for the Geysers.. Jan. 16 1866 canceled 3c Proprietary revenue stamp at back of mount. Some wear at edges of mount. Emerson and Haigh Geyser Livery and Feed Stable located corner of Main and North Street. 1857 San Francisco Circular News Letter Snow Shoe Thompson Placerville Genoa NV Expressman VIA PANAMA, United States, 1851, 1c Blue, Ty II (7). Affixed and lightly cancelled by San Francisco datestamp on three-page folded The San Francisco News Letter, No 16 with A Summary of Events from Feb. 20th to March 5th, 1857. addressed to B. Howard Esq. Boston Mass. 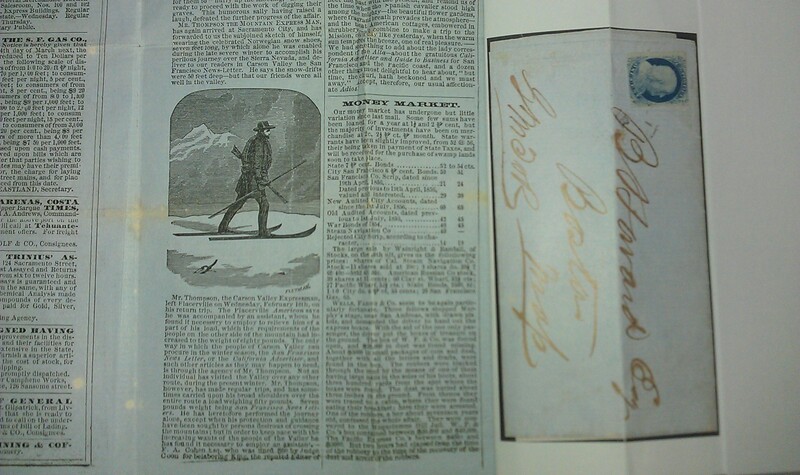 includes vignette advertisement for Mr. Thompson, the Mountain Express Man, Very Fine, the 1 cent stamp paid the reduced printed circular rate to any distance, ex Risvold, with 2014 Moorhouse Certificate. Some Info...Thompsons Carson Valley Express was established by John A. Snowshoe Thompson was in operation in 1857 and operated between Genoa, Nevada and Placerville, California. He also carried the overland mails for Chorpenning during the winter months of 1861. Snowshoe died on 15 May, 1876. The San Francisco News Letter was published by Frederick Marriott and served to advance his intertwining financial and political interests, to level attacks against his foes, and to extort money from public figures who he threatened with the prospect of scandalous news reports. Each publication date was tied to an outbound Pacific Mail Steam Ship Company sailing to Panama and was sold by all Wells Fargo & Company agents throughout California. This issue Per Steamer Golden Age.